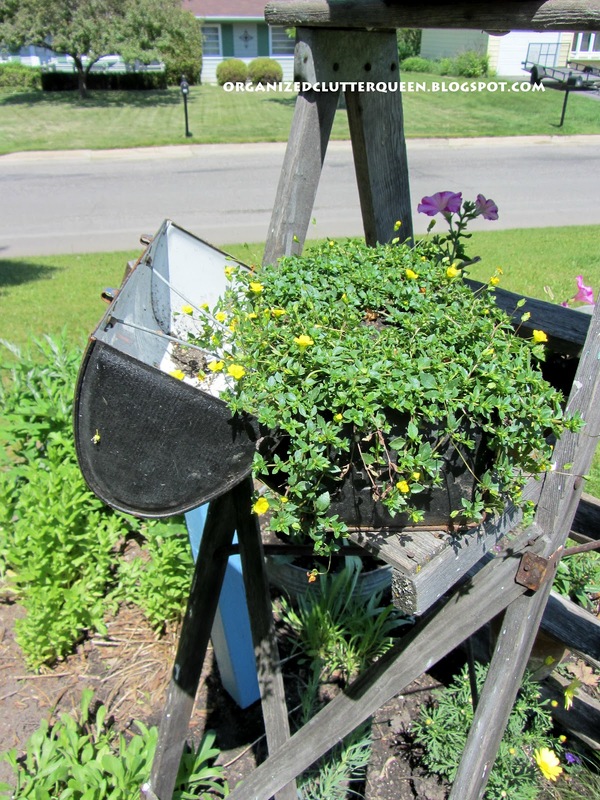 I have included an old weathered stepladder in my front yard flower border for 10+ years. I like the way it adds vertical interest to the garden. Now don't expect these 2012 photos to look anything like that post! 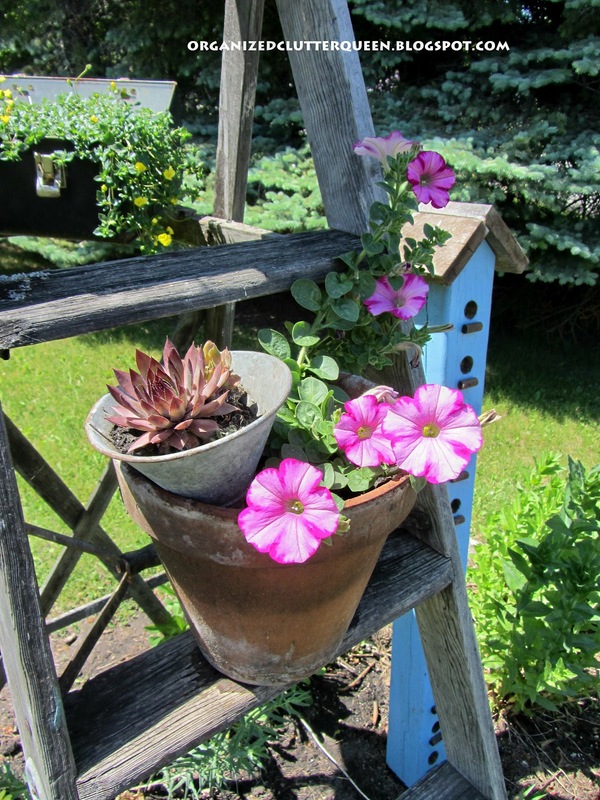 These annuals were just planted, and none of the perennials are in bloom yet. The previous stepladder post contained July photos. On the bottom rung, two pink Angelonia Angelface. Not even blooming yet! Below the bottom rung are purple trailing verbena. On the third rung, (I place a plant on every other), is a Superbells calibrachoa with a small funnel planted with hen and chicks. 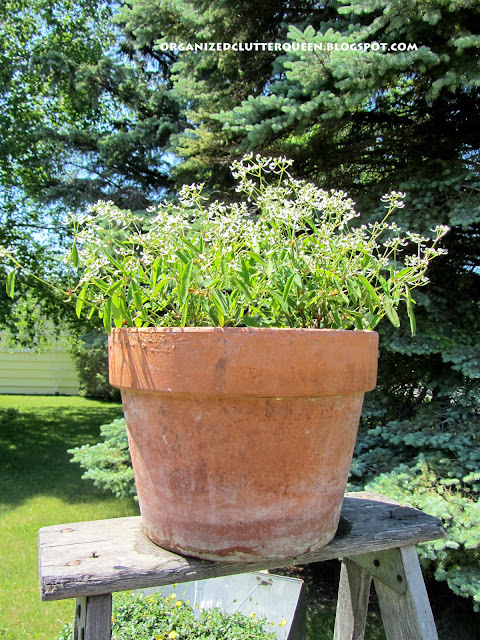 The top step has two Diamond Frost in a terra cotta pot. The (not a step) step on the opposite side of the stepladder has a vintage lunch box with two Gold Dust Mercardonia. Certainly not beautiful yet, but I will show the stepladder again when it has filled in! We planted so many lunch boxes and funnels in buckets for the cottage. They are great sellers. We are on our second batch of them. So cute, Carlene. 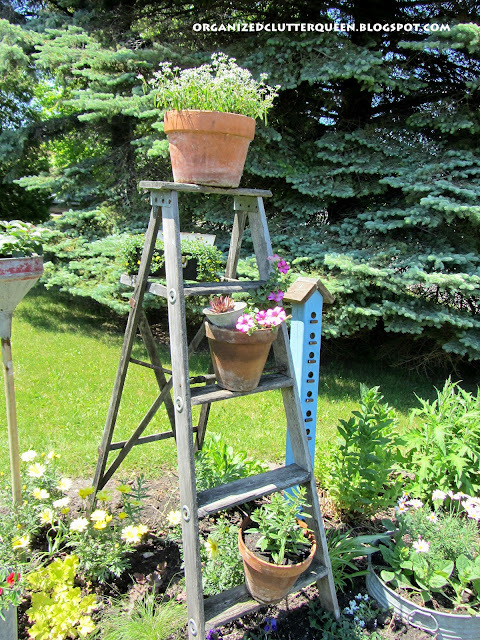 I love your vintage ladder! 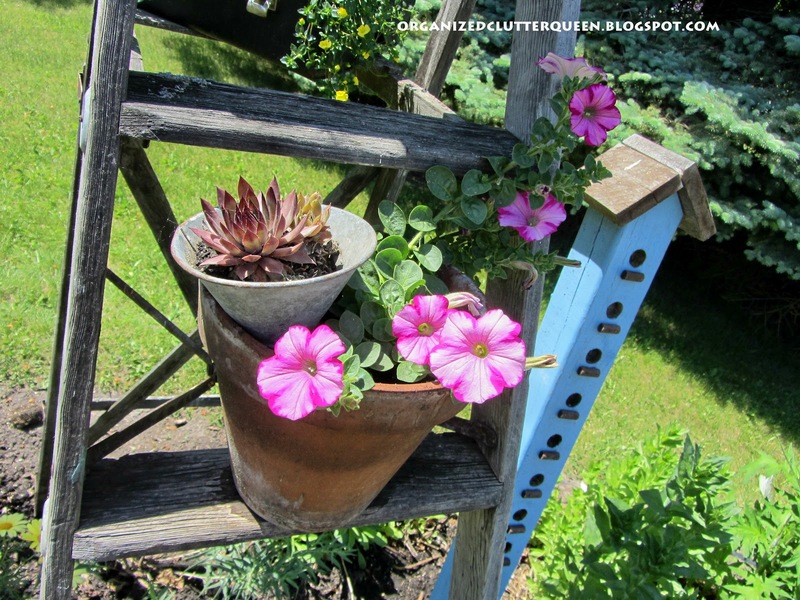 Love your funnel planter on a stick. All looks so good. 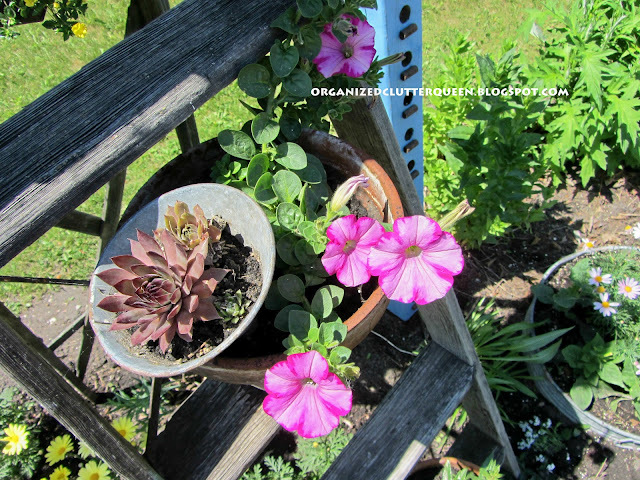 I have not had time to do my Spring plantings yet and now it is almost too late. I have some old lunchboxes that I need to fill with plants.Thanks for stopping by Timeless Treasures and leaving such a nice comment. Oh your ladder looks so good!! This is just so cute. LOVE it...I have one that I should do the same thing with it. Come by and share it at NTT. I love the ladder with the plants! I am really enjoying this kind of decorating in the garden. TFS! This is just lovely. It adds character I love the idea. Carlene, Love the plants on you ladder. The Diamond Frost euphorbia is a great plant.it blooms here till frost. I've only used the Angelface angelonia once and it did really well, too. 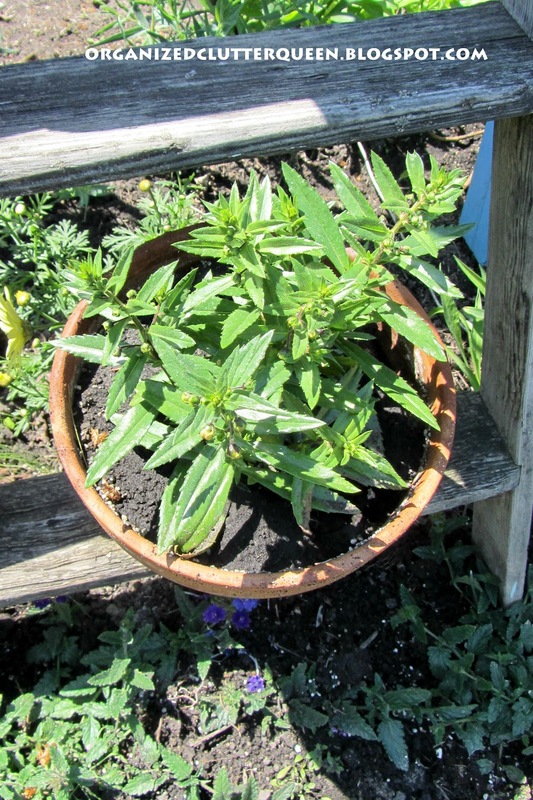 I love Proven Winners plants, but this year they were so expensive at the garden center. I had a whopping bill when I checked out. Your idea of putting the Hens and Chicks in the funnel is adorable. I'll have to try that...hope the funnel doesn't fry them in our heat. Your plants are going to grow by leaps and bounds with this hot humid weather! I looked at last year's photo- beautiful! I am stealing my husband's ladder and putting it in my flower garden first thing in the morning. I love, love, love this idea! Love, love, love the vintage lunch box w/ flowers! Very nice. All of those lovely flowers will certainly be happy as they cascade down the steps. Everything looks so cute. I love the funnel idea. It will all look so amazing when all the flowers compltely fill in! Thank you for sharing with us at TTF this week! Have a great day. 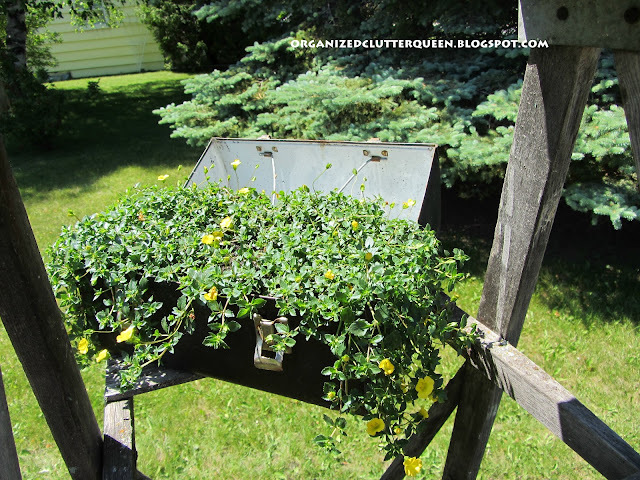 I love the idea of using a ladder in the garden and the lunch box planter is such a wonderful idea. Thanks for linking to the Open House party and have a great week. 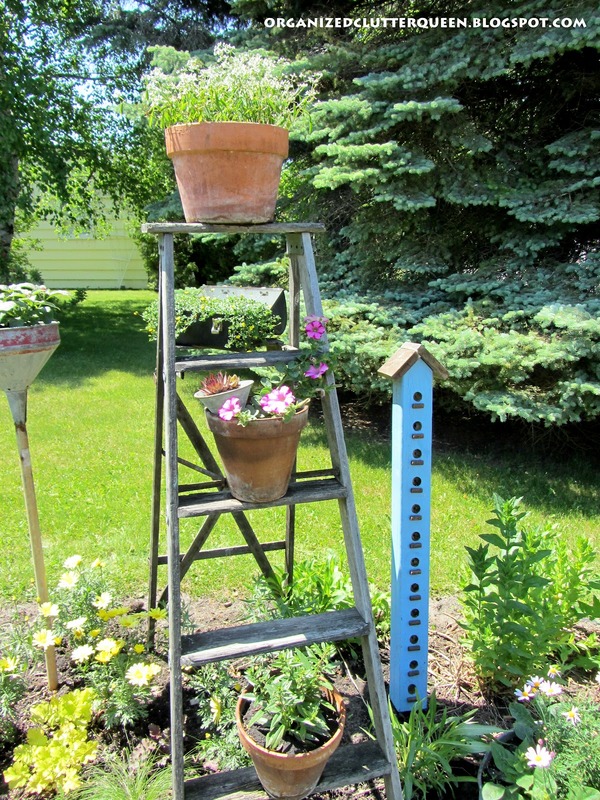 Your old ladder looks perfect in the flowerbed..........love it. Carlene the ladder idea is just perfect. Love it! It still looks very nice though! Do you leave it up in the Winter? Do you decorate it with something else then? I have several and they're not stable enough to use anymore as ladders for a person but that would be a cute idea! 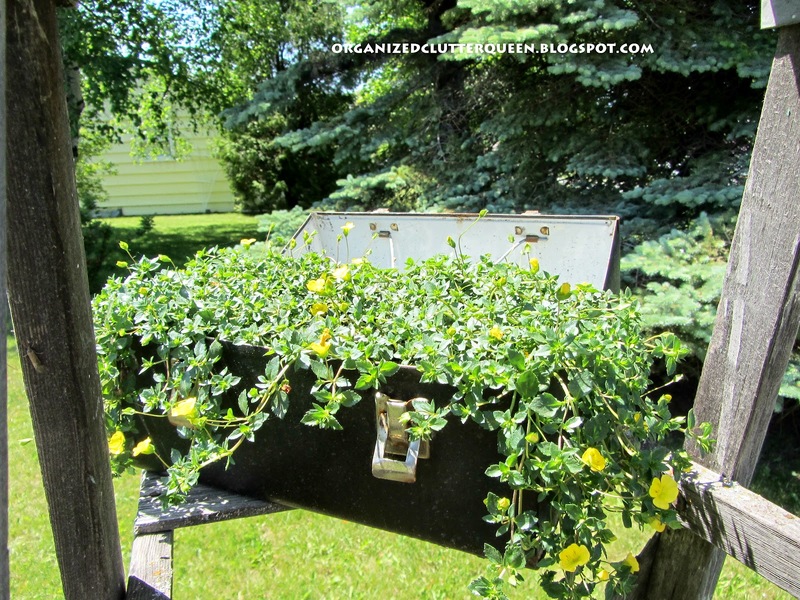 YOu have such great ideas and vignettes inside and out!